The Annapolis Elementary School community recognizes the limitations of its urban setting and has agreed to a play space that is less than half of the recommended state minimum. 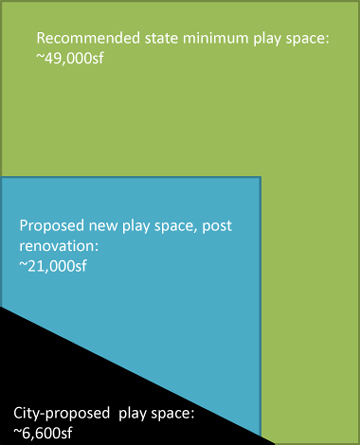 If the city’s plan goes forward, the AES play space will be reduced to approximately 13% of state recommended minimums and none of it would be green space (the state recommends 45,000sf turf and 4,000 hard top). The city plan is unfair to a school that has already bent to its urban reality. Along with the current playground, hard-top play area, and basketball court, AES also stands to lose the raised-bed vegetable gardens built and maintained by the AES faculty, students, and parents, which are used as part of its instructional program. AES serves students in the Downtown Annapolis, West Street, Clay Street, Murray Hill, Presidents Hill, Naval Academy and Naval Station Annapolis communities. 48% of the student population receives free lunches, and 11% receives reduced-cost lunches. For many of these students, the AES play area is the only source of outdoor exercise they receive. The playground and basketball court are the only facilities of their kind in downtown Annapolis.